Continuing our journey through the former East Germany on this video series, we call firstly in the industrial city of Chemnitz. During the time of the DDR it was renamed Karl-Marx-Stadt, but returned to its original name after reunification. In 1960 a narrow gauge tramway was replaced by the standard gauge system. Over the years since then the system has been expanded and now features a modern fleet using double ended low-floor Variotrams, as well as single-ended cars of this type built by Bombardier alongside very much rebuilt Tatra T3Ds. Our filming takes place in Brückenstraße, Straße Der Nationen, Bahnhofstraße and outside the Hauptbahnhof. There is plenty of action from this very smart and interesting fleet. The striking yellow, blue and white livery is set off against the trams sporting overall advertisements. The older Tatra T3D are much in evidence and it is interesting to note how heavily they have been rebuilt to give them a more modern appearance. Our second location on this programme is to small city of Erfurt. The very pretty central area is an excellent backdrop to observe the trams operating. The system runs on metre gauge track and is mostly street-based. Extensions have been built to new housing areas. The fleet consists of a mixture of older Tatra KT4D cars and newer partly low-floor vehicles built by Duewag. The latest trams are completely low-floor and are built by Siemens. Our filming starts at Anger and continues to include Fischmarkt, Domplatz, Schlosser Straße and the Hauptbahnhof. A surprise appearance of Museum car 92 makes our day as we film it running through the city at Fischmarkt and Anger. Dating from 1938 this immaculate little tram was built by Gotha / AEG, and was obtained from Gotha in 1983. A fitting end to this interesting programme of some of the tram systems of the former east Germany. 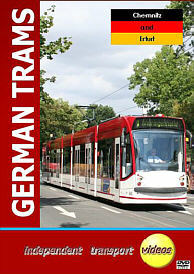 To compliment this programme have a look at our German Trams 3 and German Trams 4 titles.